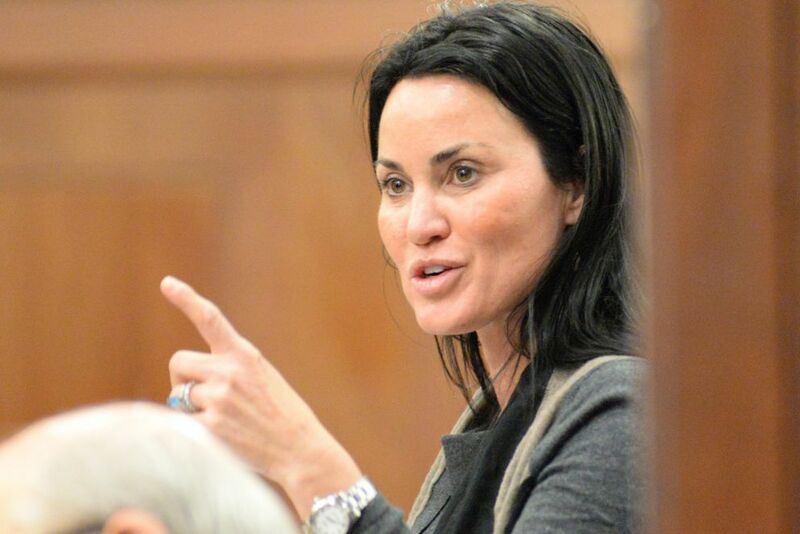 JUNEAU — State records show Sen. Lesil McGuire claimed her legislative expense pay last month for days that she spent vacationing in Germany, where she posted photos on the internet of her son and her ex-husband, Tom Anderson. McGuire, an Anchorage Republican who's retiring this year, claimed seven days worth of legislative expenses that included the time she was in Germany — $247 daily, or a total of $1,729. Her weekly claim form, which appears to have been signed by an aide, said she was holding constituent meetings in Anchorage between June 7 and 12. But in a Facebook post on June 7, she wrote she was "off to Germany!" "We watched all the Chevy Chase vacation movies to prepare for 'Lederhosen and Kraut — A German family vacation,' " said McGuire's post, made while the Legislature prepared for a five-day break from its Juneau special session called by Gov. Bill Walker. Subsequent posts by McGuire on June 9 and 11 described visits to the German cities of Leipzig and Berlin. The form for the following week, which claimed another $1,729, said she was in Anchorage holding constituent meetings for all seven days, even though McGuire was present in Juneau for the final day of the special session, June 19. Asked Monday about the discrepancy between her expense claims and Facebook posts, McGuire walked away from a reporter without answering the question. One of her aides, Jesse Logan, whose name appears to match the scrawled signature on the form, emailed a prepared statement but didn't respond to specific questions about McGuire's claims, which have been paid by the state. "During legislative sessions, members are not required to conduct all of their business in Juneau, and frequently travel to their home districts or other places for meetings. It is an important aspect of representing a diverse constituency," Logan wrote. "Members claim per diem during session to offset the cost of maintaining a home in their district and lodging expenses in Juneau. Traveling does not alleviate that double expense." In addition to their regular $50,400 salary, the Legislature's current policy says lawmakers are entitled to the per diem payments "during a legislative session" with no restrictions or requirement that legislators be at work or in Juneau. The only difference is what the IRS takes: Payments for days spent outside the capital city are subject to payroll taxes as if the money was salary, not expenses. Per diem is paid automatically during the regular session, which was set by a citizen initiative at 90 days but this year extended an extra month. Payments had to be claimed for the most recent special session. Last year's total per diem payments ranged from $24,400 to $37,000, with a few Anchorage-area legislators, including McGuire, collecting thousands of dollars during a special session held within commuting distance of their homes. Claims by the three Juneau legislators, whose per diem rate is 75 percent of their colleagues', were between $19,300 and $26,600. This year, the payments were roughly $20,000 for the regular session, plus $7,000 for the extension for most lawmakers. For the special session, the per diem claims varied widely. Palmer Republican Rep. Shelley Hughes, a candidate for a state Senate seat, turned down the payments altogether, while McGuire and a dozen others received more than $6,000. Senators in McGuire's Republican-led majority were told to claim per diem for the special session "as you need it," said North Pole Republican Sen. John Coghill, the majority leader. "Don't make me answer for other people," he said in an interview. "I have a hard enough time answering for myself." Asked if the majority had a responsibility to police its members' claims, Coghill responded: "We have, by saying, 'If you need it, it's there. If you don't need it, don't take it.' Beyond that, it becomes significant babysitting." McGuire wasn't the only legislator to claim per diem while she was away from Juneau during the special session — there were at least a handful of others. One was Fairbanks Democratic Rep. Adam Wool, who said he claimed the taxable payments for some of the days he spent in his home city working on constituent issues and tending to "work stuff" at his bar, the Blue Loon. Wool, in his first two-year term, said he initially followed the instructions of the Legislature's accountants by claiming the non-Juneau, taxable per diem. He said he thought he should receive less money, even before taxes, while he was home — enough to cover the ongoing costs of his Juneau housing, but not food or other expenses there. "Now, I'm told it's the same amount, and I'm like, 'That doesn't make any sense,' " he said. "I was really not expecting to get per diem when I wasn't in Juneau." Wool said he ultimately reimbursed the state $88 for the food portion of the per diem for each day he was in Fairbanks. Another Democrat, Anchorage Rep. Andy Josephson, claimed per diem on a four-day personal trip to Seattle while the Legislature was taking a break during the recent special session. He said he followed the Legislature's accountants' instructions when he claimed the payments, citing the fact that he was still paying for his Juneau bedroom that cost $30 nightly. Like Wool, however, Josephson assumed his payment would be reduced when he checked the box saying he was outside Juneau, he said. He also acknowledged that $247 a day is far more than lawmakers need. Referring to a downtown Juneau hotel, he added: "Unless one stayed every night at the Baranof and had a bottle of wine and lobster, I don't know how else one arrives at $240." The Legislature's per diem payments were a tiny fraction of the state's $3.2 billion budget deficit: They totaled about $1.8 million for this year's regular and special sessions, according to a preliminary accounting by the Legislative Affairs Agency. But they come as many members of the Republican-led majorities in the House and Senate have criticized government spending levels. And some have said they would need to see sharper spending cuts before they'll endorse the taxes and other revenue-raising measures that Walker and many experts say are needed to balance the state budget. "It's not a huge part of the solution, but it's certainly symbolic," said Bob Weinstein, former mayor of the city of Ketchikan and a vocal critic of the Legislature's per diem policy. "If the Legislature is not willing to cut unnecessary expenses out of its own budget, why should we have faith when they are cutting essential services?" One majority lawmaker, Sitka Republican Sen. Bert Stedman, defended the Legislature's policy, saying he didn't think the $247 covered more than living costs. "I don't think you come out ahead," Stedman said. "And I think when you look at it over the career, you're definitely going backwards." He said he claims per diem as long as he's in Juneau or if he's traveling in his district. "If I go out to my cabin, that's a little different," he said. "I don't claim it then."